Change of View, a three year old gelding by Bullet Train, broke his maiden by 1-1/4 lengths on Thursday at Delaware Park going 1-1/16th on the turf. Mystic Joy, a three year old filly from the first crop of BULLET TRAIN, won the 7th race by 1-1/4 lengths, a maiden special weight at Mountaineer, yesterday sprinting six furlongs on dirt. From BloodHorse.com – “Five Each Way, a half sister to group/grade 1 winner Miss Temple City, scored her maiden victory Jan. 1 in a maiden special weight at Tampa Bay Downs for trainer Graham Motion. Going a mile on firm turf, Shack’s Legacy set a moderate pace while the eventual winner tucked in mid-pack behind horses. Rounding the final turn, the once spread-out field bunched together and with a furlong to go, Five Each Way was able to accelerate away to win by 1 1/2 lengths in just her second start. The daughter of Bullet Train finished seventh in her Nov. 18 debut at Laurel Park. At the time Motion stated it was not where he originally intended to start the then 2-year-old filly. BULLET TRAIN was represented by another Maiden winner on Monday as Bullet Express, a two year old gelding, won the 1st race at Turf Paradise going 7-1/2 furlongs on the grass. BULLET TRAIN GETS HIS FIRST STAKES WINNER! Whiskey Train, a two year old gelding by BULLET TRAIN, broke his maiden in the $75,000 Armed Forces Stakes at Gulfstream Park on Saturday! Whiskey Train was disqualified after crossing the wire first in his Maiden Special Weight debut, but came back to graduate in stakes company with this effort. Congratulation to all of the connections, as this looks to be a colt with a big future! 1ST CROP BULLET TRAIN YEARLINGS SELL WELL DOWN UNDER! Bullet Train’s first crop of Southern Hemisphere yearlings were very well received yesterday at Magic Millions in Australia. Hip 355, a colt out of the mare Kinder Surprise (AUS) brought A$150,000 from Kent Fleming Racing. Hip 364, a filly out of Lacey Lonhbreak (AUS) brought A$110,000 from Magic Millions as agent. Nick De Meric went to $40,000 to secure a racy looking yearling colt from the first crop of BULLET TRAIN yesterday at the OBS Winter Mixed Sale. BULLET TRAIN SIRES FIRST FOAL! The first foal for the Sadler’s Wells son who is also a 3/4-brother to Frankel, Bullet Train, sired his first foal over the weekend. Steven Sullivan bred a strong and correct filly out of Viscountess (IRE), a winning daughter of Green Desert. Bullet Train, a 114 Timeform rated Group 3 winner and early favorite for the Group 1 Epsom Derby, is a 3/4-brother to arguably the greatest horse of all time, Frankel. 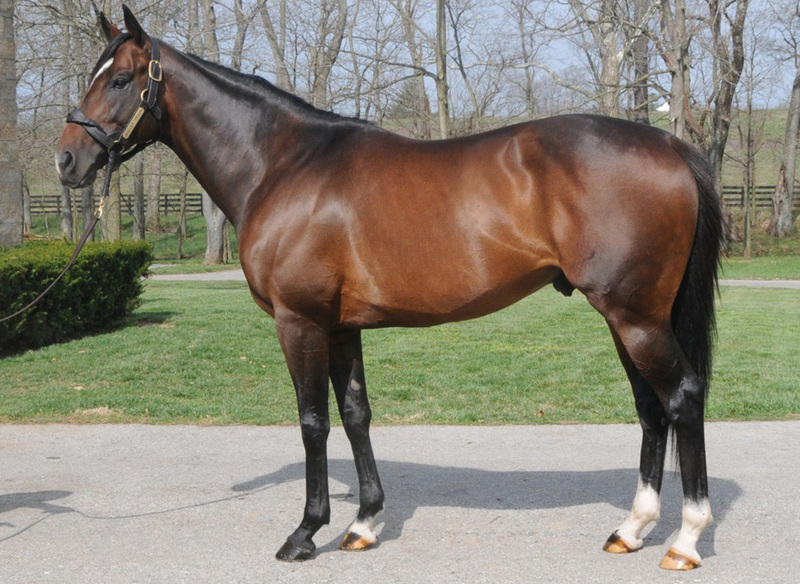 Bullet Train was bred to over 200 mares between both hemispheres last year. Thank You to everyone who made it out to our Stallion Open House today! We had a great crowd! We would also like to congratulate the winners from our 2014 Stallion Season Raffle! We are thrilled to announce that Bullet Train (GB) (Sadler’s Wells–Kind(IRE), by Danehill), the group-winning three-parts brother to world champion Frankel (GB)(Galileo (IRE)), will stand the 2014 breeding season at Crestwood Farm.